It’s an ideal primo for a New Year’s Eve dinner or a romantic supper for two. Vegetable or chicken broth, preferably homemade, q.b. Melt a good knob of butter (perhaps 50g or half a stick) in a large saucepan. Sauté the shallots very gently in the butter for a minute or two, taking care not to brown the butter or the shallots. Turn the flame up to medium. Add the rice and let it “toast” for a couple of minutes, then add a glass of champagne. Let the champagne evaporate. Now add a ladleful of broth to the rice. Simmer over medium heat, stirring from time to time, until the broth has been absorbed by the rice. Add another ladleful of broth and repeat for a total of 18 minutes or so. The rice is done when it’s still al dente but without any chalkiness in the center. When the rice is almost done, add a second glass of champagne and let it evaporate—only partially, like me, you like your risotto quite loose. Off heat, add the Parmigiano-Reggiano and, if you like, another knob of butter to the rice. Stir vigorously for 30 seconds or so, until the cheese and butter have melted and the rice has developed a nice, creamy texture. 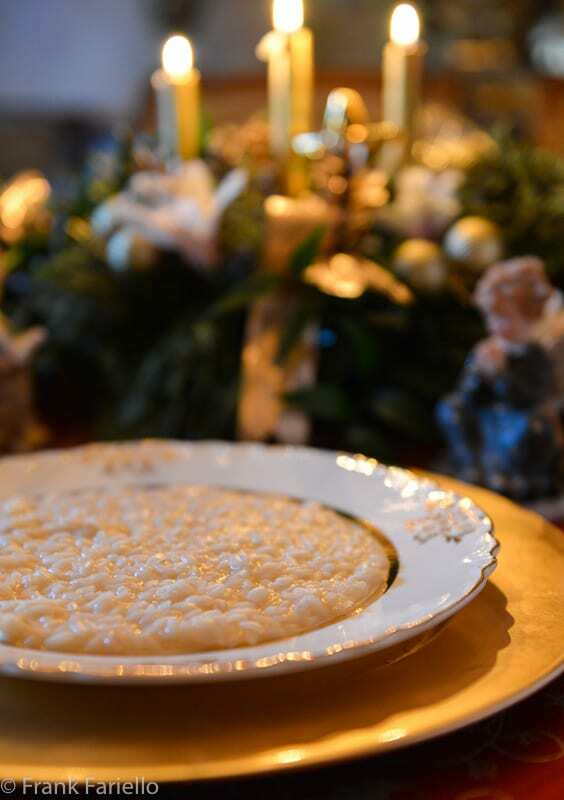 Serve and eat your Champagne Risotto immediately, preferably by candlelight. Vegetable broth is really the best choice here. It’s delicate enough to let the taste of the Champagne shine through and, as I’ve written about before, the New Year’s Eve dinner, or cenone di san Silvestro, is traditionally a meatless meal, just like Christmas Eve. But chicken broth (which curiously is called for in almost all English language recipes for this dish but in almost no Italian ones) will work fine. Don’t use beef broth, which would be too assertive. You can serve risotto quite firm if you like, with very little liquid left, but this risotto is at its most appealing, I think, served quite creamy, so that it oozes all over the plate. To get this effect, take the risotto off the heat before that last bit of Champagne has evaporated. Or add a bit more Champagne or broth along with the butter and cheese off heat at the end. And serve your risotto right away—the longer you wait, the less creamy the risotto will be. If you find Champagne a bit too extravagant for cooking, a good Prosecco or another dry, sparkling white wine will do. The amount of bubbly varies enormously from recipe to recipe. At one end of the spectrum, you can add just the usual glassful at the beginning and leave it at that. At the other end, a few recipes call for simmering the rice entirely in Champagne. (I haven’t tried this but, aside from the expense, I would think the result would be just too acidic for my taste.) Some recipes calls for a middle-way, simmering the rice in ladlefuls of broth alternating with glassfuls of Champagne. I find the technique here, with Champagne at the beginning and the end, is not only relatively economical but also provides a nicely balanced dish. You can definitely taste the Champagne without it becoming overwhelming. Recipes for Champagne Risotto also vary enormously in the amount of Parmigiano-Reggiano they call for. (And for an elegant dish like this one, you want to real thing, not an Ersatz domestic Parmesan or an everyday Italian grana—although some recipes go for the more assertive provola.) Some recipes call for prodigious amounts of cheese, up to half of the weight of the rice!—at which point you might want to call your creation a risotto parmigiano e champagne, just to be fair. But you do want to be generous in any case. The cheese provides creaminess, savor and balances the acidity of the Champagne. And if you don’t have shallots, a good old yellow onion do the job. Champagne Risotto is wonderful on its own, but you can treat it as a kind of culinary canvas for all sorts of garnishes, too. Shavings of Parmigiano-Reggiano for instance, or if you want to be really extravagant, white truffle. Or a sprinkling of minced chives or salmon caviar or pomegranate seeds. Or perhaps some toasted pine nuts or crumbled walnuts for a little crunch. And cooked garnishes like sautéed mushrooms or shrimp are a wonderful complement, too. Or, if like me you’re mourning the recent passing of the great Gualtiero Marchesi, you might lay a small square of edible gold leaf in the center of your risotto, and shed a tear. Turn the flame up to medium. Add the rice and let it "toast" for a couple of minutes, then add a glass of champagne. Let the champagne evaporate. Now add a ladleful of broth to the rice. Simmer over medium heat, stirring from time to time, until the broth has been absorbed by the rice. Add another ladleful of broth and repeat for a total of 18 minutes or so. The rice is done when it's still al dente but without any chalkiness in the center. Wow – what a spectacular dish – definitely worthy of a New Years eve dinner or something uber special! I’ve made risotto with wine before but never with Champagne. Incredibly lovely! Queste sono le vere ricette delle feste (ma io me lo mangerei anche durante la settimana questo risotto). Che lusso e che bonta’ con lo champagne. Mi piacciono un sacco le tue ricette. Ciao e buona epifania! What a wonderful post! It just gets better as you read it. I love everything right straight through the garnishes! I’m guessing you could probably do this with leftover champagne which I do have on occasion. Definitely! And thanks for your kind words, Jeff! How wonderful! I don’t have champagne but I do have a nice prosecco. Looking forward to trying this! Happy New Year! Happy New Year to you, too, Marcellina! My husband loves risotto but I rarely make it. After reading your post I have no excuses left to not make it. A prosperous and happy New Year! Ha ha! That’s right, no excuses, Gerlinde! Funny, risotto is a staple in our house. It’s so versatile and, once you get the hang of it, one of the quickest and easiest ways to whip up a weeknight (or any) dinner… Happy New Year to you, too! Although we didn’t end up making this for our cenone yesterday, we do have leftover prosecco to make it today. The simplicity of this risotto is so appealing to me. Happy New Year, Frank – may 2018 be a fantastic year for you! A perfect dish to celebrate the New Year. Wishing you all the best in 2018. Risotto used to be my go to dish in a restaurant, but about 15 years ago I was watching a hotel chef preparing risotto while I was jogging at the gym. I was absolutely horrified to see him add a good pound of butter and heavy cream at the end to finish the dish! I haven’t ordered it since! For me, the dish is at its best in a recipe like yours, simple and one that allows the flavours of each ingredient play into the result, allowing the rice to add the creamy texture. I’ve never thought about making champagne risotto but it’s sounds awesome! I’m definitely going to give it a try in the new year. I wish you all the best in health and happiness for 2018! That’s what I call the lazy way to make your risotto creamy… better to make it at home! Happy New Year to you, too, Eva. Simple and sumptuous. Just the way to ring in the New Year. Cheers, Frank. Buon Anno! Buon anno anche a te, Domenica! Same to you and yours, Paola! Simple yet every so elegant Frank – I love it! My preference is for a more creamy risotto as well and that extra champagne is delightful during the stirring process. Some time ago I created a risotto with Gavi in honor of my Gavi producer, he was delighted yet explained to me that in the town to Gavi this was quite commonplace. Well, not surprising, I guess! I’m sure it’s delicious as well. Happy New Year! Un brindisi to you Frank for a fantastic and successful 2018 ! Thanks so much Carla, and Happy New Year to you, too! Mille Grazie, and Buon Capo d’Anno!! Baci! Let’s say 1 glass=4-6 ounces? A few ounces either way won’t make much difference, as the liquid will evaporate. But if it helps… Hope you enjoy the dish. Happy New Year! Fabulous! When I have extra champagne I usually reduce it for vinaigrette’s. Now I have another purpose! I imagine this risotto is subtle and delicious! It is, Mimi. Worth a try! Happy New Year! anche tu risotto per festeggiare l’Anno Nuovo, tantissimi auguri Frank ! Grazie Chiara! Le grandi menti si incontrano.. 😉 Buon anno! Never tried risotto with salted water, I’m intrigued. I’ll ha e to try it next time. Suppose it lets the pure flavor of the rice shine through? Of course for that you do need good quality rice. Speaking of which I did just recently try Aquarello for the first time. I do like it but like you I’m not entirely convinced it’s worth the exorbitant price. Now, this is a meal fit for a king or queen. It sounds delicious! I’ve never had risotto made with champagne. I thinking a romantic Valentine’s Day dinner with this as a first course. Felice Anno Nuovo!